Target 1 "Cracking Dragon" you control; destroy all monsters your opponent controls with equal or lower Level to that target, also, until the End Phase of this turn, that target gains ATK equal to the combined Levels of the destroyed monsters x 100. You can only activate one "Traffic Blast" per turn. The activation and effects of “Lunalight” Monster effects cannot be negated by your opponent’s card effects. Once per turn, you can target 1 “Lunalight” Card in your Pendulum Zone or face-up in your Extra Deck; Special Summon it and if you do, you can send 1 “Lunalight” Spell/Trap or “Luna Light Perfume” from your Deck to the GY. Once per turn, during the End Phase, you can take 1 “Lunalight” Card or “Luna Light Perfume” in your GY or among your banished cards and either add it to your Hand (if it is in your GY) or return it to the GY (if it is among your banished cards). 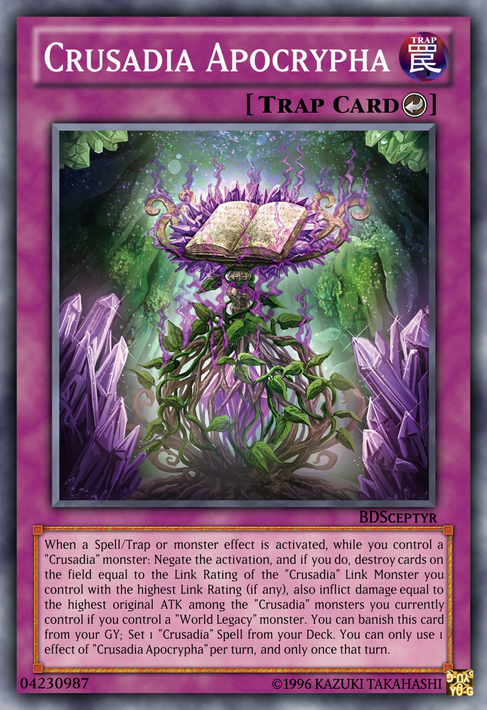 Lore: When a Spell/Trap or monster effect is activated, while you control a "Crusadia" monster: Negate the activation, and if you do, destroy cards on the field equal to the Link Rating of the "Crusadia" Link Monster you control with the highest Link Rating (if any), also inflict damage equal to the highest original ATK among the "Crusadia" monsters you currently control if you control a "World Legacy" monster. You can banish this card from your GY; Set 1 "Crusadia" Spell from your Deck. You can only use 1 effect of "Crusadia Apocrypha" per turn, and only once that turn. A Tindangle draw Spell with a GY effect, perhaps?